Per Mertesacker played 24 times for Arsenal in the Premier League last season as they finished runners-up. 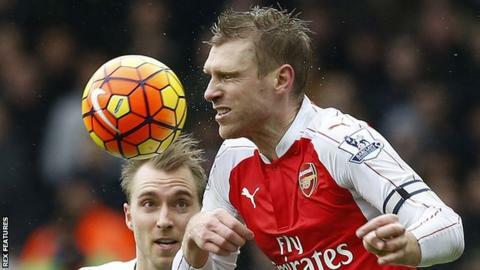 Arsenal defender Per Mertesacker, who is yet to play this season because of injury, has signed a one-year contract extension. The 32-year-old, who won the 2014 World Cup with Germany, is recovering from a knee injury he suffered in pre-season. "Mentally, he's a guy who brings a level of urgency into the team," said Wenger on Thursday. "He is back in training, but not with the squad." Mertesacker's contract was due to expire in the summer. Wenger added: "There were no negotiations in fact, because he had an option for extension. "So it's not really a new contract, it's just an extension of the old one. We had to take that option early in the season and the decision was made quite easily." Mertesacker joined Arsenal from Werder Bremen in August 2011 and has won two FA Cups with the Gunners. Meanwhile, Wenger does not expect to "do anything special" during transfer window. The Gunners are fourth in the Premier League table, eight points behind leaders Chelsea. With striker Danny Welbeck available after a long-term knee injury, Wenger described Arsenal's attacking options as "very strong". "I expect it to be a very quiet period because we have Danny Welbeck coming back," added the Frenchman. "Offensively we are very strong, we have many players who can come in." Arsenal announced the signing of left-back Cohen Bramall, 20, from non-league side Hednesford Town for £40,000 earlier this month.